When people come to your site, you can set an advert to appear straight away or shortly after they arrive. Entrance adverts are becoming popular as they have maximum impact and convert incredibly well, allowing you to start making money from the moment a user visits your site. You can control how often your entrance adverts are shown so that for example, an ad is only shown to one in every ten visitors. Our technology automatically places an on or shortly after arrival. You can set how often an ad appears, at what point it appears and for how long it is displayed for. Sign up (in about 30 seconds) and you can either install a WordPress plugin or a small piece of code to add to your website. Nope, all of our ads are displayed in a simple clean and clear format which either timeout after a few seconds or can be manually hidden. We think it’s really important to allow users to easily skip the ads if they’re not interested so that we don’t start annoying people unnecessarily. When you sign up to Gapad, you are given a management dashboard area where you can control how often an ad displays, and view statistics on how they have performed. 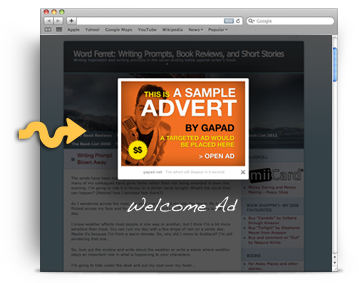 You’ll also see how much money the ads have accumulated on an ongoing basis.